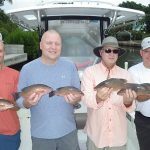 Fishing inshore around Anna Maria Island remains consistently good, although with recent cold fronts and windy days, patience may be needed to find the bite. On windy days, the best fishing has been occurring in calm waters. For example, to fish the leeward side of a mangrove island would be advantageous. Trying to find areas where the water is clear, as opposed to muddy, is another good indication for good fishing. Most inshore species like to inhabit areas of calm, clean water, so this what you also need to find angling success. When it’s cold and windy, think about finding a comfortable fishing spot, because there’s a good chance the fish are looking to do the same. Moving into the grass flats of upper Sarasota Bay, Girle is targeting spotted seatrout. Using a 1/4-ounce jig head with a MirrOlure Lil John attached, Girle’s charters are jigging up good numbers of fish in water depths of 3-5 feet. You can also use a live shrimp under a popping cork to get in on the action if you’re not familiar with jigging. Last but not least, Girle is catching keeper-size redfish on the shallower flats of Sarasota Bay. Again, Girle is using a jig to target his prey. Fish up to 28 inches are being caught, although most are in the 22-inch range. Capt. Mark Johnston of Just Reel fishing charters is working northern Sarasota Bay and the waters around Cortez, targeting redfish with live shrimp for bait. Johnston takes a two-pronged approach to find the wintertime reds for his clients. First, he’s targeting docks that have deep, sheltered water in canals. These areas are productive, especially on cold, windy days. When fishing docks, Johnston uses 30-pound fluorocarbon leader, a size 1 hook and a split shot to get his shrimp to the bottom. Johnston also is targeting redfish on the shallower grass flats of Sarasota Bay. He likes to find sandy potholes surrounded by shallows to find these reds. By free-lining a live shrimp into the potholes, Johnston’s clients are catching keeper-size fish along with a lot of smaller reds. Other species Johnston is catching this past week include sheepshead and flounder. Again, Johnston is using live shrimp to get the bite. To find these fish, Johnston is working both rocky areas in Sarasota Bay and around docks. He likes to use the same rig as if dock fishing for reds. Race Foster at the Sunshine Skyway Bridge South Fishing Pier is seeing good numbers of Spanish mackerel crashing on schools of baitfish around the pier. He says pier fishers using Gotcha plugs or small silver spoons are catching respectable-sized macks on early morning incoming tides. For bait fishers, flounder and sheepshead are being caught on live shrimp around the pier pilings. Remember, when fishing from the Skyway piers, a strong tide can make bottom fishing difficult. Try to target either the beginning or end of the tide during the full and new moon phases. This will make it easier to keep bait in place without a heavy sinker. Lastly, pier fishers using small jigs are catching pompano and silver trout. You can fish these small white jigs straight up or you can tip them with a small piece of fresh-cut shrimp if the fish are being picky. Oldham also recommends using a small hook, some fluorocarbon leader, and a split shot for a sheepshead rig. “Keep it simple,” he suggests. On the flats of Anna Maria Sound, Oldham says he’s hearing of an abundance of spotted seatrout, although most are undersized. Trout fishers using soft plastics on a jig head are getting the bite. Oldham suggests finding a grass flat, then drift and cast to the sandy potholes to find the trout. Capt. Rick Gross of Fishy Business charters is working nearshore structure in search of a variety of reef species. Gross is targeting rock piles and ledges in water depths ranging 30-40 feet to find concentrations of fish. The most abundant catch on Gross’ recent charters was sheepshead. Gross likes to use a live shrimp on a jig head to get the convict fish to bite. By slowly dropping a shrimp to the bottom, Gross’ charters are reeling up sheepies in the 5-pound range. On the same rig and bait, Gross is also getting good action on Key West grunts and triggerfish. With no size or bag limit, Gross’ charters are catching sufficient numbers of grunts for a fish fry. 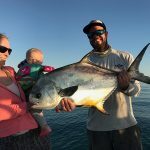 There also are an abundance of triggerfish in the same areas as the grunts, although, according to Gross, reaching the 14-inch limit for keeper-size fish has been challenging. Capt. Mark Howard of SumoTime Fishing Charters reports nice fish landed and brought to the cleaning table this past week. The sheepshead are gathering in big schools preparing for the full moon spawn and feeding heavily on the moving tides. Howard likes to use fresh shrimp threaded on the small No.1 hook with enough weight to keep the bait on the bottom. Don Goodwin and sons from New Hampshire fished last week with Howard and landed their share of sheepshead and speckled trout. They put 15 nice sheepshead in the box and ended up with two bags of fillets for a family fish fry. Redfish are still around the deep-water docks and structure feeding on live shrimp. Howard says the key to catching these fish is to get the bait into the shadows of the dock. Howard reports landing mixed-size reds. Looking forward, the winter season is at its peak and the transition to the spring pattern has begun. Howard suggests shiners may arrive in the next few weeks and the fishing opportunities will increase. “Many species will invade our waters and the fishing will only get more exciting and action packed,” Howard adds.